This issue of AEMS News and Reviews covers three documentaries that focus on the theme of global consumption and its impact on the local agricultural production in Asian countries as well as people's individual lives. Agrarian Utopia (reviewed by Dr. Matthew Winters) sets its scene in the rice farms of Thailand depicting how two struggling peasants under a capitalistic pyramid scheme seek different ways out from under the changing economical-political environment. Bitter Seeds (reviewed by Dr. Rini Bhattacharya Mehta) is the final film in Micha X. Peled's Globalization Trilogy, following Store Wars: When Wal-Mart Comes to Town and China Blue. It reveals shocking facts concerning Indian farmers, such as the high rate of suicides resulting from debt, and shows how these phenomena relate to the changes created by globalized industrial agriculture. Cotton Road (reviewed by Ms. Joy Yang Jiao) traces the transnational movement of cotton and tells the stories of the day to day life of workers in a conventional cotton supply chain. This documentary ties these phenomena back to the US showing how the clothes we consume have their roots worldwide and travel through a global labor chain from raw material to finished product to store shelves. Therefore, showing that our clothing choices impact people's lives and the global ecomony far beyond the local store. These three documentaries, screened in our AsiaLENS film series in the Fall 2015 semester, were very well received by audiences. We are fortunate to have the film discussants write these reviews as well. Our next issue will include three documentary reviews on LGBT issues in Asian countries, and we will see how various Asian perspectives shed light on our understanding of the LGBT issues. We will also be screening these documentaries during our Spring AsiaLENS series in Spurluck Museum. In the near future you can find more information on both of these on our website and through our listserves. Stay tuned and happy new year of 2016! Directed by Uruphong Raksasad. 2009. 121 minutes. In Thai with English subtitles. Reviewed by Dr. Matthew S. Winters. Five minutes into Thai-director Uruphong Raksasad's fictional, documentary-style film, Agrarian Utopia, we find ourselves watching a 2007 rally of the People's Power Party, a party allied with former Thai Prime Minister Thaksin Shinawatra. The male heads of the two farming households on which the film focuses for its two hours sit and listen. One of them loses interest quickly and walks off, just as People's Power Party leader Samak Sundaravej comes to the podium. As we follow the farmer winding his way out of the crowd, Samak laments that Thailand has suffered from a coup, despite having crafted a constitution in 1997 that he says was "among the world's most democratic." He refers to the 2006 coup that removed Thaksin from office. Having found himself under a mountain of debt, the main character has already decided to take his family to the countryside and farm with his friend. The remainder of the film follows the two families through two seasons of the rice crop, the first ending in a disappointing payout from the middleman that is mostly claimed by the landlord who needs to pay back a car loan of his own, and the second ending prematurely with the landowner announcing that he has sold the land and needs the farmers to vacate it for the new owners. We watch through the two seasons as the families plant and harvest rice, struggle to train a water buffalo to plow the field, and scrounge for any available food source: snakes and rats from the fields, beehives that they find in trees and on the nearby temple. We watch as their children bathe in rain puddles and split their time between helpful contributions to the families' tasks and play. The slow scenes, what A.O. Scott in the New York Times called the "weary endurance" of the farmers, test the endurance of the modern film-watcher but also succeed in transporting the viewers to the wet-rice agricultural life that remains common to so many rural citizens of Southeast Asia. Directed by Micha X. Peled. 2012. 88 minutes. In Hindi with English subtitles. Review by Rini Bhattacharya Mehta. 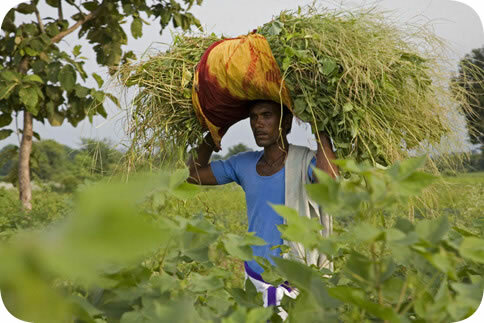 The subject of Bitter Seeds, the third and the final film in Micha X. Peled's (aptly named) Globalization Trilogy, is the continuing saga of debt-ridden Indian farmers committing suicide by consuming pesticide, a story that is heartbreaking, to the uninitiated, but familiar to the point of banal to readers of Indian newspapers. Focusing on Vidarbha, the cotton-growing region of the Indian state of Maharashtra, Peled follows a yearlong cycle of cultivation through the experience of one farmer's family - the purchase and sowing of seeds, caring for the plants, picking the cotton and the eventual transport of the cotton to the local market on a bullock-cart - with extraordinary attention to detail, and the result is a compassionate and realistic account of 'industrial agriculture' in the era of globalization. Directed by Laura Kissel. 2014. 72 minutes. In Chinese and English with English subtitles. Review by Ms. Joy Yang Jiao. From the tranquil cotton fields in rural South Carolina, to the buzzing metropolis of Shanghai, runs an ethnographic journey of something taken for granted: clothing. Americans consume nearly twenty billion new items of clothing each year, yet few know or care to know how our clothes are made, much less who produces them. This new documentary Cotton Road uncovers the transnational movement of cotton and tells the stories of worker's lives in a conventional cotton supply chain. From rural farms in southern United States, to massive factory cities in China, the critical lens spans the globe to examine the industrial processes behind our rapacious consumption of cheap clothing and textile products. As it explores a contemporary landscape of globalized labor through human stories, Cotton Road raises the question: are we connected to one another through the things we consume? The film provides an opportunity to reflect on the ways our consumption impacts others and drives a global economy. A film by Kathy Huang. 2011. 56 minutes. In Indonesian with English subtitles. Post-screening discussion by Leslie Morrow, Director, LGBT Resource Center, Office of Inclusion and Intercultural Relations, University of Illinois at Urbana-Champaign. Directed by Sonali Gulati. 2011. 71 minutes. In Hindi and English with English subtitles.